Over twenty years ago, Westone changed the way music was played. With the introduction of the original universal-fit, balanced-armature in-ear monitor, Westone changed the way music was performed, rehearsed, listened to, and loved. The Westone UM Series in-ear musician's monitors are used and loved the world over, not only onstage, but by serious music lovers regardless of the type of music they listen to. Designed for the musician and the music lover, the UM1 delivers the same premium sound with the incredible audio clarity that only a Westone In-Ear Monitor can provide, but at a consumer-friendly price that is applicable to any consumer. SENSITIVITY: 114 dB @ 1mW FREQ. 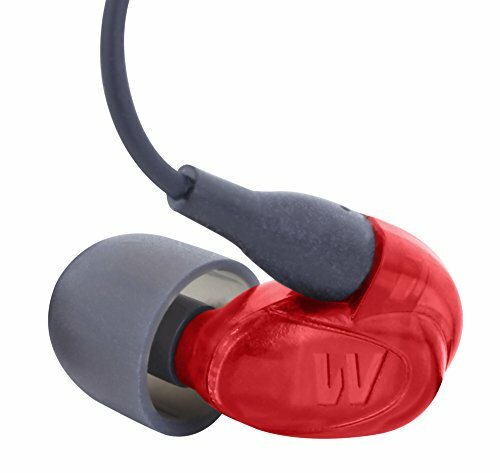 WESTONE SOUND FOR THE BUDGET MUSICIAN: The UM1 uses a proprietary, single balanced-armature driver to deliver a dynamic and articulate soundstage with enhanced sonic detail and extended frequency range, and all the detail and clarity musicians have come to expect from a professional in-ear monitor. THE MOST COMPACT, LOW PROFILE, ERGONOMIC DESIGN IN THE WORLD: Designed and built to perform in the most demanding environments, the compact, low-profile, ergonomic design of the UM1 is incredibly comfortable, and can be worn for hours and hours. Westone's silicone and comfort foam eartips enhance the performance of our IEMs by providing superior noise isolation and ensuring a superb fit. ROUND MMCX AUDIO CABLE: Westone's MMCX Audio "Round" Cable is manufactured using a high-strength, high-flex, ultra-low resistance tensile wire featuring MMCX Audio Connectors, a 3.5mm stereo plug and is perfect for use on-stage, or for personal listening. TECHNICAL SPECS: The Westone UM1 features a full-range, single balanced-armature driver with 114 dB @ 1mW sensitivity, 20Hz - 16kHz frequency response, and an impedance of 19 ohms @ 1kHz. IN THE BOX + WARRANTY: Purchase includes; 1 pair Westone UM1 In-Ear Monitors, MMCX Audio Round Cable, 5 pair Patented STAR Silicone Eartips, 5 pair TRUE-FIT Comfort Foam Eartips, Monitor Pouch, Cleaning Tool, and a 1-year warranty.